Amongst the constellation of rare bottles that I have tasted over the years, few approach the 1955 Réserve des Célestins from the late Henri Bonneau in terms of an unrepeatable experience at the hands of fermented grape juice. It is a wine that lies on the edge of existence: I have never seen another bottle at auction and have never seen a tasting note. But this bottle appeared without warning at an extraordinary Sunday lunch in West Hampstead, London. Our munificent host requested a guest to pour the wine blind and I remember his look of incredulity as he said: “Guys, you are not going to believe what I’m pouring. You’ll never drink it again.” Considering the experience gathered around that table, that is some claim, but he was completely right. The Grenache-based Réserve des Célestins debuted in the 1920s, although I cannot ascertain if the 1955 was made by Henri Bonneau himself or his father. At the time, I remember someone mentioning that this was Bonneau’s second vintage although the label reads “Domaine Marcel Bonneau”. The 1955 Châteauneuf-du-Pape Réserve des Célestins is mature in colour with a wide tawny rim but clear core, not unlike a mature Burgundy. The bouquet throws you far from the southern Rhône and such is its volatility, I foolishly think I am in the realms of mature Tawny Port! Then after 10 to 15 minutes the wine calms down and that volatility ebbs to reveal a gorgeous mélange of kirsch, candied orange peel, clove and fennel, all shrouded in a veil of warmth. The palate is beautifully balanced, probably towards the end of its drinking plateau, yet utterly compelling, with an extant core of smudged red fruit, hints of sage, white pepper and (again) fennel. It is as much a wine of texture as flavour, so smooth and harmonious that is takes your breath away. 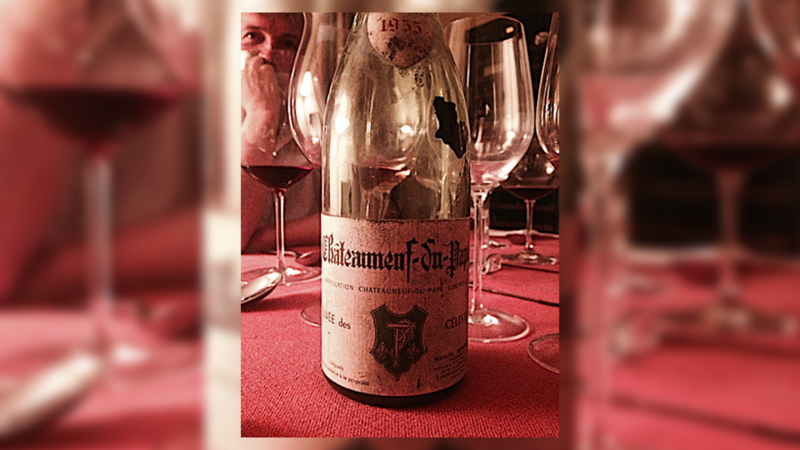 It is a remarkable Châteauneuf-du-Pape made at the dawn of the career of its greatest vigneron. Remarkable. 97/Drink: 2018-2023.